Make your own hands smokehouse, bloat fish or meat, try and feel how delicious food can be normal after smoking! Products in the process of smoking will have an amazingflavor and taste, and the taste is a little similar to the taste of smoked products purchased in the store. However, it should first understand the intricacies, and only then decide what to do with their hands smokehouse for hot and cold smoking. The man began to smoke products as needed. It has been observed that after smoking, they can be stored and does not deteriorate over a long time. Early man is allowed to take part in the provisions with a smoked rather than hope for luck in hunting or fishing during long hikes. We Copts products in the homemainly in order to give them a different, unique taste. You can use hot or cold smoking. And smokehouse themselves are of two types. Their design is almost indistinguishable. 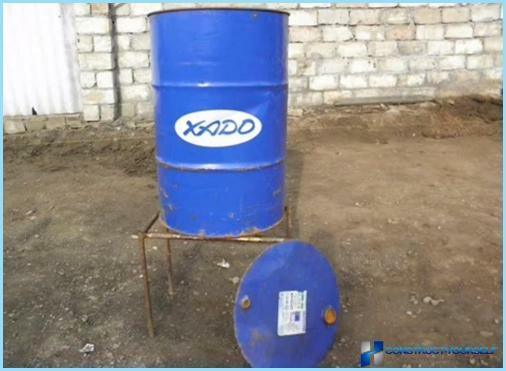 It is necessary to equip the center, the camera with hooks, where the products will be suspended and the Copts, a device for collecting oil, which will be released in the process of smoking. smoking chamber should be placed in a sealed enclosure. And what is the difference between hot and cold smoked? After all, both processes involve a stay of products that are in a confined space, the smoke from the smoldering sawdust or shavings. The main difference lies in the distance separating chamber in which the products are smoked, from the hearth. For smoked smoke temperature should be high enough for the cold - 35 ° C. Mandatory requirement - smoking can not be carried out over an open fire. Cold smoking takes considerably moretime compared to hot smoked. In this way, the products retain their appearance and become an amazing taste and aroma. Cold smoking process takes place at a temperature of about 30 ° C and lasts for several days. Hurry should not be, because at this temperature the bacteria breed well and bringing the process to the end, you risk instead of the delicious dishes get severe poisoning. Usually cold smoking lasts 5-7 days, but may last several weeks. chips and sawdust fruit trees (cherry, apple, sea buckthorn). It should be remembered that the focus should be to arrange the sidelinesfrom the camera for cold smoking. 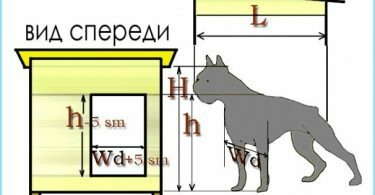 A good option would be dug pit at the far corner of the site, is not to use the natural height difference. In the pit, equipped with a fireplace, which must be connected to the camera chimney. 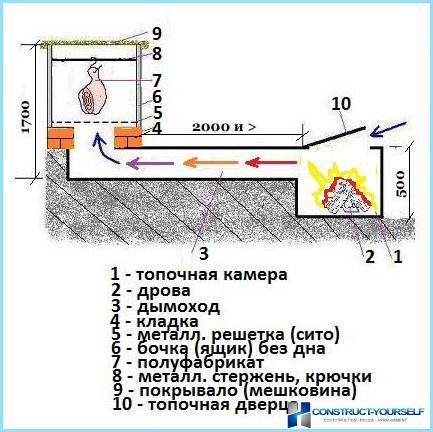 The outbreak is not necessary to lay out a place for the fire bricks, enough to impose the hearth wall. Very important! The length of the chimney is usually done 2.5-3.0 meters. To do this, dig a trench width of 0.5 meters and a depth of 0.25-0.3 meters, lay out the sides and bottom bricks, bonded with clay mortar, close the top sheet metal or slate, sprinkle the ground. Instead of a brick chimney in the trench can be placed chimney. Consider the top of the valve chamber to adjust the air flow, combustion intensity and excess smoke output. The valve can be cut from sheet metal. 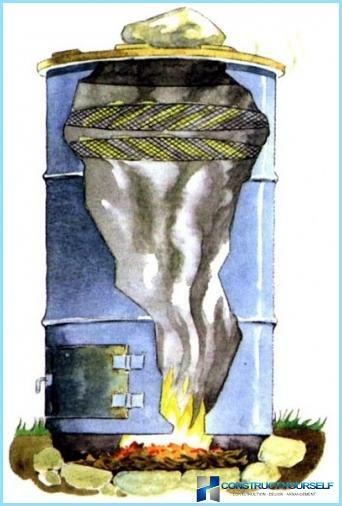 Place the chimney junction and the camera (requires a diameter of 200 mm) make sealed with the help of available funds. You can use the same clay solution. The chimney is built. 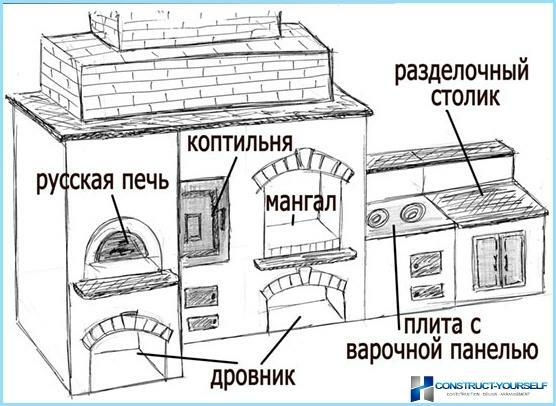 Another solution could be the installation of pechki- "stoves", the chimney of the chimney and install cameras to smoke above the chimney liner. Simple smokehouse with his own hands the easiestmanufacture of barrels. Need 100-200 liters per barrel. Cut off the top cover, the barrel before use must be cleaned and washed. At the bottom of the barrel is cut a hole for the chimney. Barrel will be installed on the bricks or blocks, so that problems with their articulation does not arise. From the cut lid or other available material manufactured tray for collecting the fat that will drain from the products during smoking. 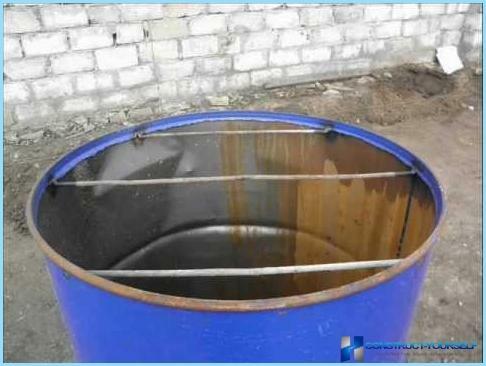 Diameter of pan should be less than the diameter of the barrel to allow the passage of smoke. We need to make a lattice of at least one,which will Copts products. This is one of the options of accommodation in smoking products. Trimming valve or fixed at the top of the barrel. On the reinforcement will cling hooks and hooks - products. Grid make from scrap materials. It may be willow twigs that are woven into the shape of the desired size. Cells desirable to fix the thin wire. You can use a thin wire and her weave grille and rim made of thicker wire. To this thick wire is wound around the drum to determine the correct size, hardly shrinks and the rim is secured. The grid is used, one or more arrays installed at various levels. In this case, the distance between the lattices be about 15 cm. To set the tray to the wall of the barrelfitting pieces are welded to the center drum form a cross. Tip: Consider a loop on a pallet, with which it will be easy to reach for cleaning. To fix the gratings can be made hinges and weld them to the walls of the barrel. Or screw the screws in the wall of the barrel. camera cover is made of hardwoodtrees. It should not be massive and it is necessary to provide several small openings for release of moisture. You can restrict jute bags, which simply jumps on the barrel during smoking. Remember that the bag should be moistened with water. Camera smoking can be folded from a brick. This will be the best solution, but to build a camera makes sense only when smoked product you are engaged constantly and reached in this case, the desired skill. Otherwise, your site will be rarely used structure of unknown purpose. It equips the smoke chamber made of brick as well as the barrel. 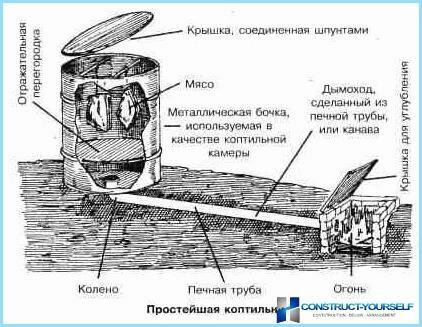 The bottom is brick chamber can be made from the cover drum or from scrap materials. 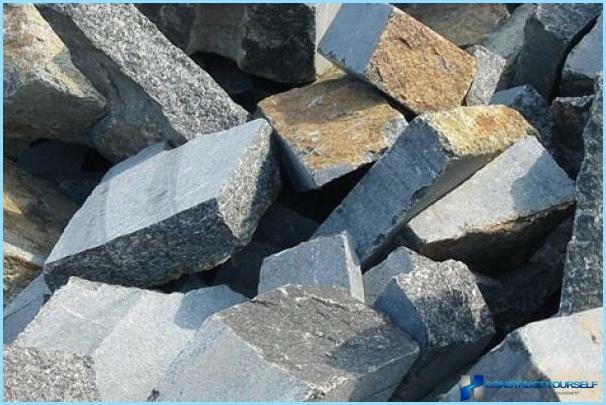 For masonry bricks used sand and clay mortar. For the production of iron sheet of the camera is cut, folded in the form of a cube, without one side (top), the seams are welded. Camera smoking can be built from a variety of materials and objects: a bucket (a small drum), an old pressure cooker or fridge. 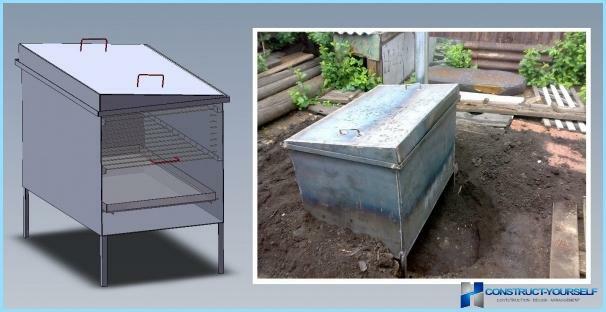 Craftsmen made even electrostaticsmokehouse for faster cold-smoked. In such a smokehouse thermal effects of the electric heater on the chip forms a smoke. Heaters are switched off periodically, thus achieving the desired temperature of smoke when entering the smoking chamber. Smoke rises through the openings, flows through the grid block BB and positively charged. When injected into the smoke chamber communicates with products that are hung on hooks. Hooks are connected to the negative pole of the BB-block. Food attracts positively charged smoke particles and these particles are deposited on them. 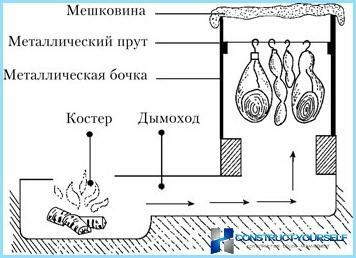 Hot smoking takes much lesstime, because the process takes place at temperatures of smoke in the range from 50 ° C to 120 ° meat C for fish. Reduces the temperature - increase the time of smoking. 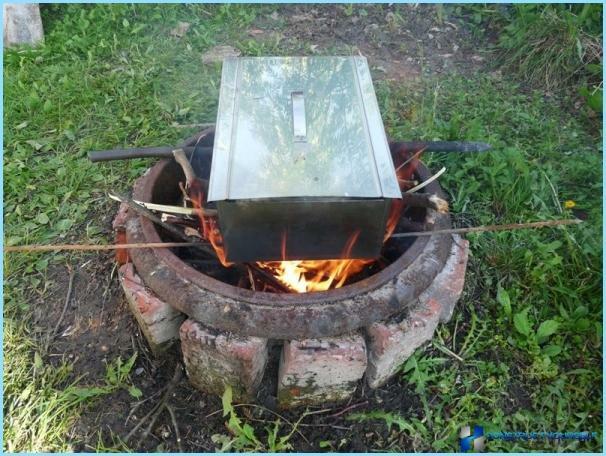 Schematically, this looks like a smokehouseway: a container of sawdust or chips mounted over an open flame or heat source (preheated oven). Important temperature at which the dust will slowly smolder, rather than the source of the fire. 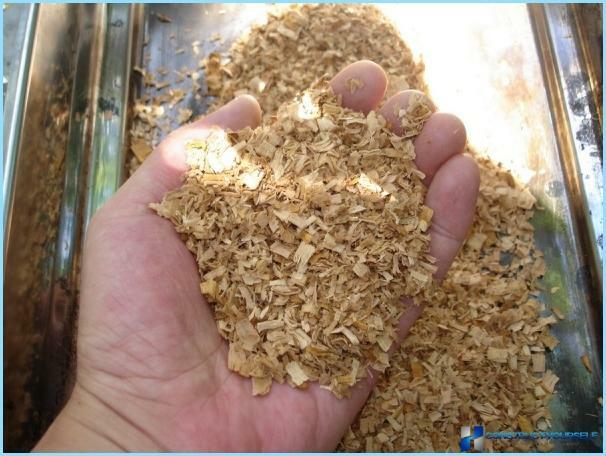 Smoke penetrates into the sawdust from smoking chamber, where the products are placed. Under the food tray is set to collect eye-catching with smoked fat. 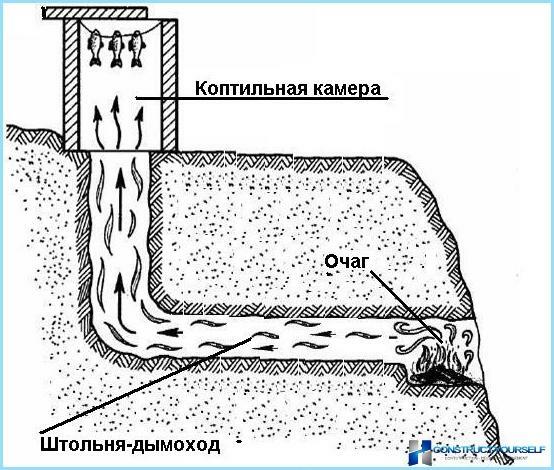 The surplus of smoke discharged through a chimney or aperture in the lid chamber. At the bottom of the barrels are cut a few holes through which the ash is disposed of and that will serve to podduvalom furnace. At the bottom of the barrel is cut out a piece of the wall, which is made from the furnace door. Suffice it to a piece the size of 200x300 mm. By the door hinges are welded and the handle-latch. For the furnace is given about a third of the volume of the barrel,the rest of the amount will be for the smoking chamber. 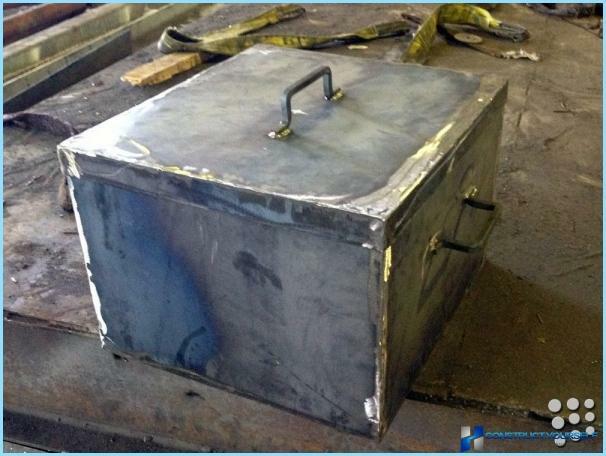 The furnace chamber and separated by a metal sheet 4 mm thick. This sheet will serve as the bottom chamber. It is welded to the walls. At the bottom of the camera is cut hole for a smokepipe. The diameter of the tubes must match the diameter of the chimney in the upper part of the chamber. 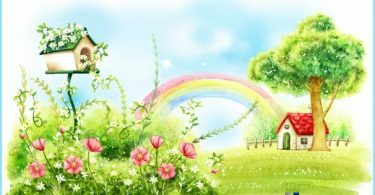 Do not be carried away by the length of the chimney, excessive thirst in the furnace is not needed. Chimney is welded to the wall of the barrel. Then you know that the tray for collecting the fat, grid or hooks, cover with a hole for the chimney. For more efficient use of the volumebarrel furnace can be placed directly underneath. 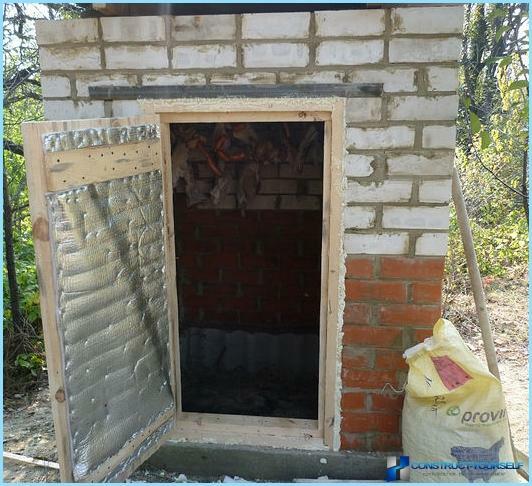 In this case, better to lay down the furnace refractory bricks, providing openings for laying sawdust and withdrawal of excess smoke. Barrel mounted on the furnace, and the released amount is used for the placement of additional grids. Council. 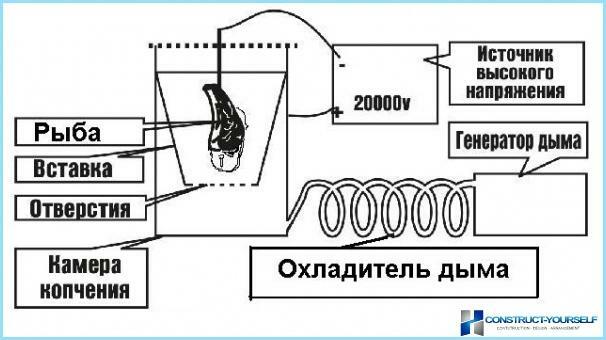 To control the fix on the wall of the barrelMechanical Thermometer with Remote Sensor. This thermometer can save you from many mistakes as you gain experience. You can use the "antiquated" method and splash on the surface of a few drops of water. If you do not hiss, nothing to worry about. 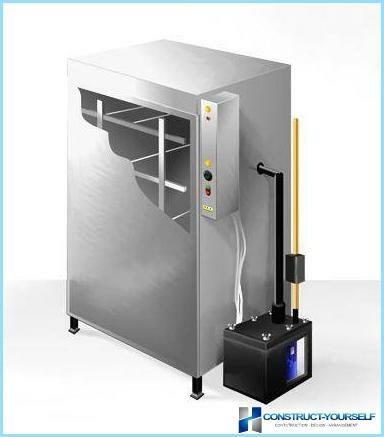 Mini smokehouse can be fitted easily inordinary metal bucket. At the bottom of the bucket are poured sawdust and shavings, the top mounted grill. At the very top of the bucket in the walls are made holes for the rods. On the bars are mounted hooks. We get two options for the product in a small volume. The cover of such a "smoking chamber" should definitely provide openings for smoke. A bucket is placed on fire. A large fire is not necessary, sawdust should only smolder. 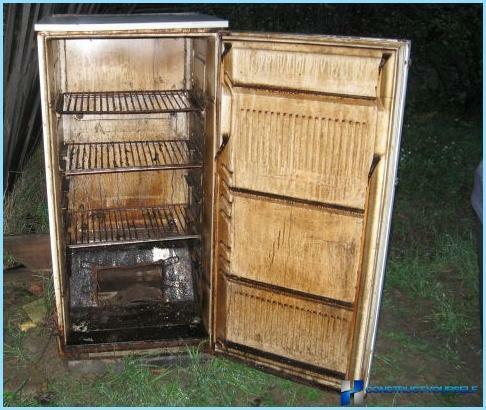 Once the decay process begins, you can lay out and hang products for smoking, and close the lid. Smoking takes from 30 minutes to an hour. 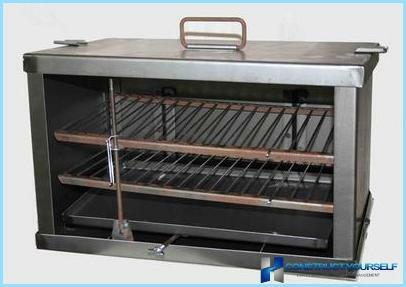 Another option mini smokehouse - metalbox with a perforated lid, which can be installed on the rack over the coals in the brazier of burnt. Barbecue, sat down and put on a smokehouse BBQ. A good option for a hike or fishing. Understand the principles of the smokehouse hotsmoking, and after a series of experiments with a barrel, you might think of a more presentable design. 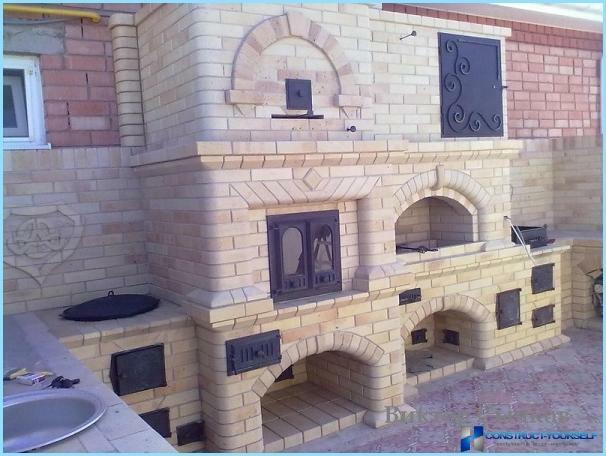 You can cook a beautiful smokehouse made of stainless steel or put it out of brick. 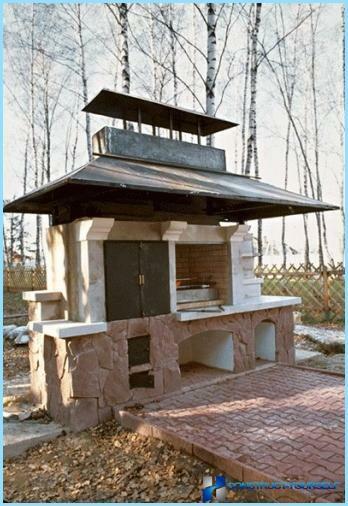 A great option for garden will combine on one platform and in one volume smokehouse and barbecue. The work will take time and effort, but it's worth it - the result will please many years. First, select a suitable place in the area,remember about fire safety. For convenience, you can bring to this place the water and sewer system. 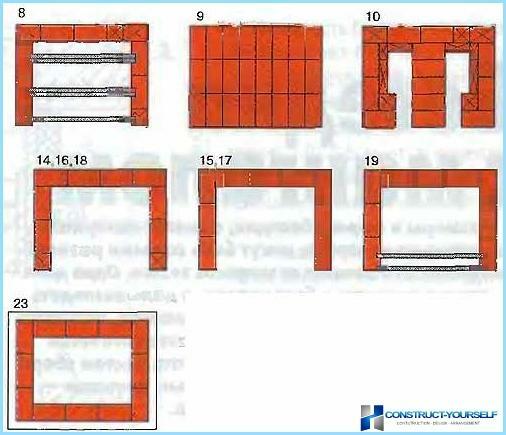 Develop a sketch of your design and be sure to make a drawing of laying each row of bricks. You'll see a drawing to greatly facilitate your work. You can do without a mixer and knead the solution by hand, but small-scale mechanization speed up several times. Prepare all the necessary materials and tools. The work begins with a clearance,selected location and manufacturing base. 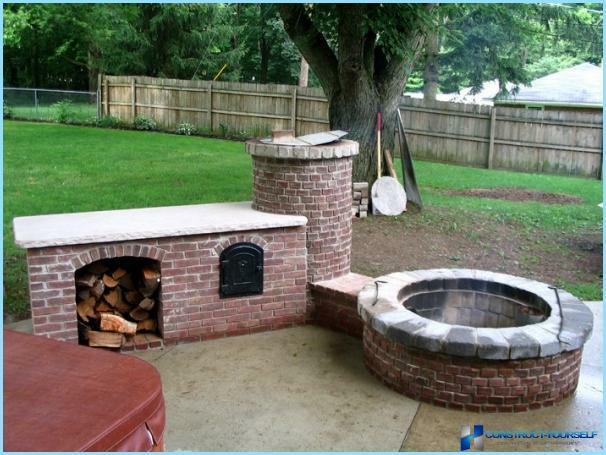 Brick smokehouse barbecue considered to have a capital structure and strip foundations can not do. 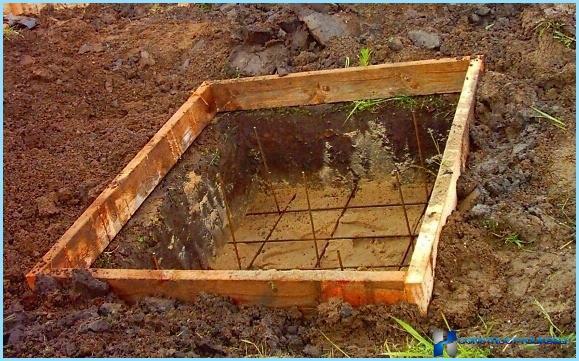 The pit dug set wooden formwork, which is necessary to upholster with roofing material. Laid a layer of crushed stone, gravel is poured and filled with a solution. Important! Twenty-four hours after drying of the first layer is next, and so on. The number of layers depends on the size and weight of the structure. The last layer is checked by level aligned make waterproofing and left for several days until completely dry. Instead, you can build a foundation of rubble concrete. Such a foundation is required to reinforce. To use the red masonry brick kiln. Start with the layout of the first row of bricks without mortar. This will help you make the layout and determine where to install grilles. Laying start by mixing sand and cementsolution with lime. Normal ratio - 3: 1: 1. Water is added to the extent that was similar to the solution of thick cream. The second and subsequent rows are stacked in Extension, bricks laying starts from the corners. Check regularly laid out horizontal rows. The corners should be strengthened laying wire. corners and fittings are installed to install the brazier between the walls of the furnace. The furnace must be of heat-resistant metal or cast iron. The grid is easier to install when a few bricks laid protruding inside the structure. 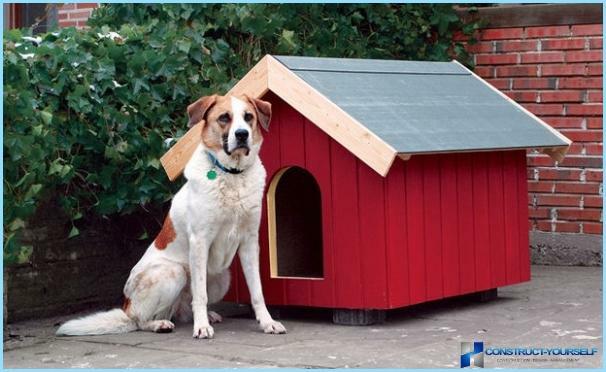 Place for drovnitsy and various household appliances can be provided in the total structure. Smokehouse is made of one of two locatedon the other volumes. So you get a smokehouse for smoked. 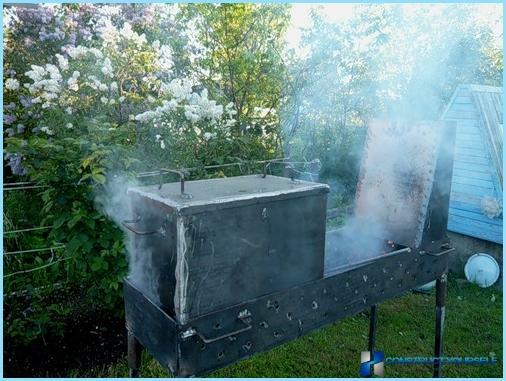 It is easy to convert to a smokehouse for smoked by placing a portable stove or fireplace on the need to remove the camera and connecting the chimney. So you can make your own hands smokehouse for hot and cold smoking. The style of its construction and decoration choose to your liking. 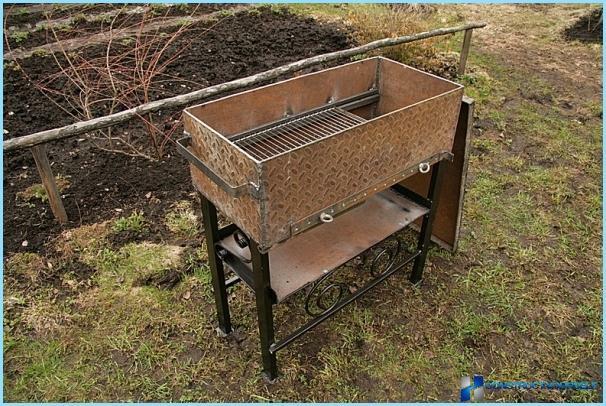 It is not all ways to make smokehousewith his own hands for the hot and cold smoking. Among them are very cheap (option with a bucket) and quite expensive (BBQ-brick smokehouse). You decide, but in any case on your desk now always be a place delicious smoked products.